1 Blemished Available: $233.99 This item is available as a Blem/Refurb. These are items that cannot be sold as "New" merchandise and are limited to stock on hand. See the product details for a description of the product's condition. 1 Blemished Available: $207.99 This item is available as a Blem/Refurb. These are items that cannot be sold as "New" merchandise and are limited to stock on hand. See the product details for a description of the product's condition. 1 Blemished Available: $199.99 This item is available as a Blem/Refurb. These are items that cannot be sold as "New" merchandise and are limited to stock on hand. See the product details for a description of the product's condition. I use this in and around town, there is a lot of wind buffeting on the highway, but the goggle setup offers a wide field of view. I ran into an issue with a broken side cover on mine after owning for over a year, Revzilla replaced it and shipped helmet back for free- Awesome customer service. Bought this helmet in 2015 when it was still called the Raw. Bought it for looks, and looks were basically all I got. Initially it was OK, but over time some problems started developing. -- Straps became worn and torn easily. Avoid moving the goggles too much as they end up becoming loose, and going above 60-80kmph the goggles begin to shake. This is relatively a quick fix by adjusting the strap tightness, but you can only go so far (3 settings). The wear is very noticeable, akin to wool. -- Aerodynamics are incredibly bad. Again going above 60-80kmph forces your head back by the wind with lots of force, any highway ride lasting longer than 15 minutes will hurt your back and neck. It is also very loud. Can't hear anything except wind. -- Vision is slightly limited compared to other helmets. If you want this purely for the novelty look, get it while expecting the worst for comfort and functionality. Those of you wanting to spend the money on a primary helmet, I would suggest getting a different helmet that is more comfortable and higher quality. If you like the look, Shark produces higher-tiered helmets that may resolve these issues, but be cautious of this particular item because it really is just for the look. I've lasted 3 years on this thing and I've been looking forward to getting a new helmet since the first season. If you wear this every day, you may grow tired of the look that you fell in love with in the beginning. It is a high quality made helmet. I had no problems with it. I installed an intercom and did not need to cut any pieces from the helmet. Looks great as well but the downside of it are the air sound but not that annoying and the narrow vision and the dust that find a way into my eyes. I'm finaly going to write a review after 2K miles. This helmet is really good for the city commute. It always turns heads. Noise levels are on the quite side even with it being an open face helmet. The mask does a great job at keeping debris from hitting you and just looks BA. 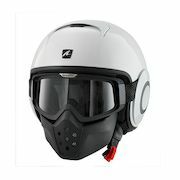 Dislikes and my biggest issue with the helmet and why I will be buying a new helmet is when riding at speeds above 50MPH and doing a head check the mask lifts off your face and it's very unnerving. Under highways speeds GREAT helmet. But I commute everyday and put a lot of highway miles on and this helmet just isn't cutting it. Hope my review helps you make an informed decision. The goggles press hard enough on the bridge of your noes to turn you into a mouth breather. When the vent is open it rattles and sound like a child is pulling a popping pull toy at twenty miles an hour inside your helmet. Even with the vent closed its louder than a half helmet. Recommend! Rode 600 miles comfy & cool, looks great, easy breathe, love strap system. 4 out 5 stars cuz side cover plastic snap easy broke when putting together & replace is $37. Other than that, awesome value! It's Great, it's Affordable, Go for it! I'm not a professional critic, unlike the seemingly vast majority of the other reviewers here. 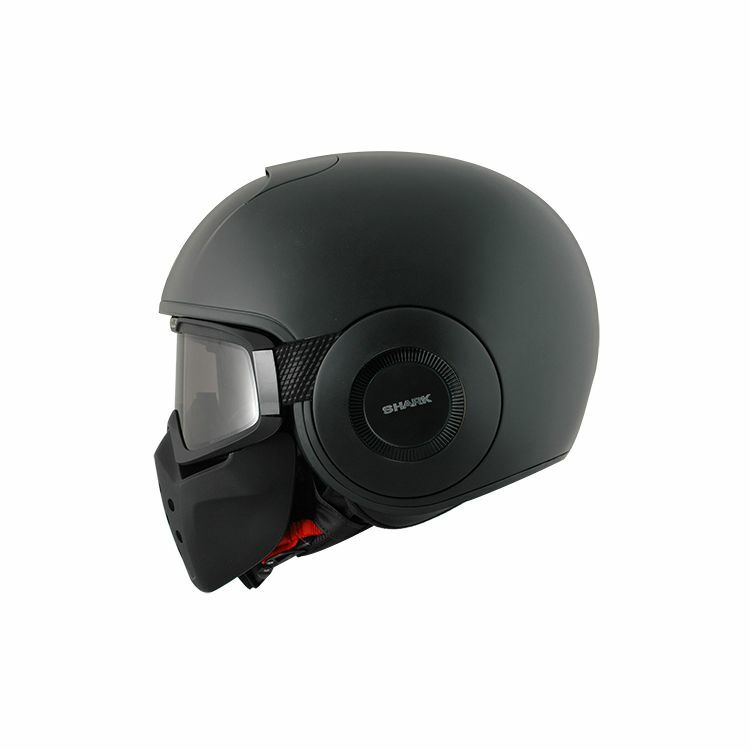 This helmet is great for everyday riding. This thing looks great, fits me perfectly, and has the right price point. I would buy a clear goggle lens though, for night; the smoke lens is little dark for non-city riding. Is it perfect? No; but what helmet is? None of them. So let's tone down the verbose criticisms shall we? So... If you want a great looking brain bucket, without spending a paycheck... GO FOR IT! The sizing was okay since I teally require the petite kind of smallness to my face but the problem was the fitness didnt get quite ok with the cheek bone area along the side, it's squeezing that part. It isnt that foamy but... is there a way i can deal with this... i guess I had the wrong fitting. The measurement then shouldnt be around the temple area only but also the cheek bone area. Hi, the helmet is all style, but the google's straps will loose in no time, i own three helmets and I use this one just for fun, and now the loose googles are dancing all over my face and it's quite annoying!. Don't get my wrong, the helmet is all good, but I think this drawback is a combobreaker! Poor optics and turbulence galore! First off, I've been riding for over 25 years, and I've had every fast Super Sport bike, Harley, and helmet that there is. I thought that this helmet would solve a lot of problems by the closing the gap between a full-face and half helmet, but it only "kind of" does that. PRO's: Fit is great (for me), quality is top notch and on par with a high-end full face, and the style is very cool, it's quiet, it's Bluetooth ready. CON's: The goggles are proprietary so you have to use the ones that come with the helmet. The goggles claim to have Carl Zeiss designed lens's, and if they do, then Carl Zeiss stinks. My lens has an imperfection cast into it, and the manufacturer will not respond. Plus, the manufacturer is in France... so even though the helmet is brand new, the warranty is useless. Now I have to replace the lens myself, and since it's a unique goggle, finding one that fits it is difficult and expensive. The face shield has holes in it (I guess for speech? ), so if you do cold weather riding, your face gets cold! There's no easy way to remove anything on this helmet, so cleaning the guard or goggles requires time and tedious tasks that must be done exactly. Conclusion: I love the helmet, but its a novelty at best. I bought it for riding the colder months, but the holes in the guard had me freezing on just a cool fall day! Because its like a trooprr helmet kind of vibe! Plus its one of a kind. Loved the look and style. The reason why I choose to purchase this helmet is because its a lightweight, my current helmet is reaching its recommenced lifespan and the Matt Green will match my bike and riding gear. Like the style. I mainly ride shorter trips and a lot of in town so I went with this. Because of all the badassery that it is. I think the helmet looks badass....but honestly it looks better on the shelf than it feels on my head! I already own one Shark Raw Helmet, it is a phenomenal helmet. I Drove 300 Miles and another 300 miles none stop with this helmet and the seal around my ears was perfect, seal around goggles to helmet is perfect, it's incredibly comfortable including the padded chin strap. Hot sunshine, excessively high winds, and even rain at night over a mountain pass, My head was always the perfect temp. My wife rides as well, she has used this helmet and now wants one as well, hence buying another one. Something to use primarily in my everyday commute to and fro work. The militant look blended with a menacing frontal drew me in. People are always asking (joking) if I just jumped out of a plane. I like the look of the helmet for use with my Triumph Speed Triple. I have a full face helmet for when I'm commuting on the Highway and plan to use the Shark 3/4 helmet around town. The white color also stands out in traffic, although not quite high-viz, the white is a good choice for visibility. Slick black finish, different from what you see on the road. Best helmet I have ever owned. It provides great DOT approved protection without being too big and it looks awesome! I liked the shape and appearance of the goggles with the face mask attached. Face mask keeps wind and bugs away but can be lifted easily. Kind of looks cool. comfortable helmet for my somewhat round head. LOOKS AND THE QUALITY OF PRODUCT. Fits my ride. I just rode out of a Harley dealership with a 2016 Softail Slim S! It has the aggressive look! For urban use mainly..maybe I will try it on with my hybrid road bike too!!! lol! This is my second one. I had a minor accident and wanted to replace it. I love the feel and of the helmet and the airflow. Great look. Unique design. However, I'm concerned it may be more form than function. Reminds me of an "Operator's" helmet! Going to awesome in uniform! The helmet is said to be dot approved, is it snell rated also? BEST ANSWER: No open face helmet will ever be Snell rated. If wanting a helmet for track full face are going to be your best friend. Does this one come with dark slide down visor? Or dark outside visor? Will I be able to replace the visor/goggles? If so, how much are the visor/goggles? BEST ANSWER: Yes, the goggles are replaceable. As of this writing they are $59.99 at Revzilla. Is this helmet DOT approved? What exactly is the chin bar part of this? Does using it provide comparable protection to a full face helmet? The lower face shield provides no physical protection. This piece is there purely for aesthetics and doubles as a wind deflector. This helmet is rated as a 3/4 face for that reason as the front face pieces are NOT crash rated. When are you guys gunna get a video up? I don't trust anyone else's reviews like yours! 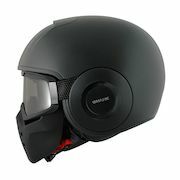 Is there a clear visor with it for night riding that you can switch b/w? BEST ANSWER: i saw on a Q&A on a english website that was selling them in europe that they only have the tinted available right now but clear goggles will be available soon. however, they said its only gonna be a light smoke so its suitable for night and day riding. Does this helmet come with a UV protected visor or at least a reflective tinted visor it would definitely boast the look more and blue tooth? How do you make a Amber lens for the raw helmet? how about the mold of raw helmets? my head round about 60-61cm. ls2 large and venom large open face fits me but i dont have idea about shark raw series??? It's a very round fit. Gave me an intense headache and cheek ache. OUCH! Hi! In my experience with the RAW helmet I can say that for a 60, 61 cm head (because I have 60 cm head too =)) this helmet fits very well, I bought the L size and is very good feeling specially when the speed begin to increase =) the air flow is not a problem the helmet fits very good and stay in it´s position, the only thing that I don´t recommend its try to use the helmet and try to put on some headphones =) You just can´t make it fit inside, =) believe me I tried, but everything else is great feeling, of course its my personal opinion and the advice will be, if possible, try it and see how it feels in you. All the best in everything and pls drive safely and enjoy your ride =)!! I have a 23.5 inch head and I ordered the XL Raw Helmet. Fit me perfectly. Snug but not tight. I have not ridden with it on yet because we still have several inches of snow on the ground. I wear it around the house a couple times a week for 10-20 minutes to help in the break it process. Each time I wear it feels even better. I can't wait for the snow to melt so I can get on the road sporting my new helmet on my Ducati Monster S4RS and Ducati Sport 1000. Good luck. My head circumference is similar and I wear XXL in most other helmets. The XL fits great. It is, fit-wise, the most comfortable helmet I own. Can you wear glasses while having the goggles are on? BEST ANSWER: YES! You can absolutely wear glasses while wearing the goggles on the Shark Raw helmet. I find myself wearing my Shark Raw much more often than I thought I would when I bought it and mostly because I can comfortably wear my prescription eyeglasses under the goggles. When I wear a half helmet I usually resort to wearing non-prescription sunglasses ... not a good idea with my poor eyesight. I highly recommend the Raw to anyone who wears eyeglasses. My answer would be no. I returned this helmet because it was way too tight around the face. I can't see wearing glasses with the googles working.